The unpredictable nature of hurricanes makes it incumbent upon Miami-Dade home and business owners to preplan their hurricane protection. Hurricane Wilma impacted Miami in 2005 with the President of the United States, George W. Bush, issuing a major disaster declaration in Miami along with twelve other counties throughout Florida. It would be another eleven years until another hurricane would strike the state, yet, only one year later, a major hurricane would again strike the state! 2017 brought the fury of Hurricane Irma when it plowed right up the belly of Florida’s peninsula leaving widespread and catastrophic damage throughout its long lifetime. It is imperative to take measures to protect your property and your life because the predictability of extreme weather is simply not possible. What will 2019 bring to your hometown? Hurricane Shutters Florida provides homes, condos, and businesses in Miami-Dade the means to protect their property and, most importantly, their lives, against Mother Nature’s fury and provide safety and security during hurricanes. An outstanding product available on the market are sleek European-styled roll-down shutters. The innovative technologies implemented with Hurricane Shutters Florida’s roll-down shutters provides the ultimate security and home protection with easy execution. Roll-down Hurricane Shutters protect against hurricanes, tropical storms, gusting winds, and even thieves trying to gain access to your home or business. If you’re looking for the easiest protection system for your windows and doors while increasing the value of your property, roll-down shutters is an avenue for you to investigate. The roll-down shutters are simple to “install” with a smooth, manual crank or an upgraded fully synchronized electric motor drive for maintenance-free operation. Roll-down shutters from Hurricane Shutters Florida, meet the most stringent wind codes in the country! These top-quality roll-down shutters have been reviewed and accepted by the Miami-Dade County Product Control Division, Florida Building Code, and the International Building Code – which is without question, some of the most rigorous building code in the world. The roll-down shutters from Hurricane Shutters Florida are constructed of the finest grade of aluminum for maximum impact resistance and durability. These specially designed roll-down shutters provide maximum strength and insulation from sun, storm, heat, noise, and weather extremes as well as protection against theft. Buy directly from our factory and save! Hurricane Shutters Florida, headquartered in Sunrise, Florida, is one of the largest, most technologically advanced manufacturers of a multitude of options for protecting your home or business including storm panels, accordion shutters, roll-downs, Bahamas, and colonials available. We are the hurricane shutter manufacturer so we can offer the lowest prices on the best quality hurricane protection and security shutters you can find online. 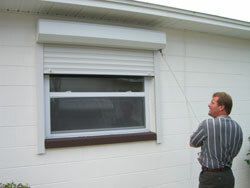 Contact Us Today for a FREE Hurricane Shutter Quote! Call us to order today at our South Florida Headquarters: (954) 474-3557. This entry was posted on Friday, January 18th, 2019 at 3:57 pm	and is filed under Decorative Shutters, Florida, Hurricane Shutters, Rolling Shutters, Security Shutters, Storm Shutters. You can follow any responses to this entry through the RSS 2.0 feed. Both comments and pings are currently closed.